Thirty years ago this month I arrived in the Department of Microbiology at Columbia University’s College of Physicians and Surgeons (P&S) to start my own laboratory. Thirty is not only a multiple of ten (which we tend to celebrate), but also a long time to be at one place. It’s clearly time to reminisce! After studying influenza viruses with Peter Palese in New York City, in 1979 I headed to David Baltimore‘s laboratory at MIT. It was not long after Baltimore had received the Nobel Prize in Physiology or Medicine for discovering retroviral reverse transcriptase. In his laboratory I first encountered poliovirus, which would hold my interest for many years to come. The moratorium on recombinant DNA research had just been lifted, and it was now possible to clone complete viral DNA genomes. My first project was to make a DNA copy of poliovirus RNA, clone it into a bacterial plasmid, and determine its sequence. The result gave us the first glimpse of the viral genome. I then found that a DNA copy of poliovirus RNA is infectious in mammalian cells, a story that I have documented elsewhere. The next step in my career was to have my own laboratory. With these two papers in hand I was able to obtain several respectable job offers, including one in the Microbiology Department at P&S. The department chair was Harold S. Ginsberg, an adenovirologist. My decision to accept his offer was influenced by the strong virology component of the department, which included Saul Silverstein and Hamish Young. I moved back to New York City in September 1982 with a DNA copy of the poliovirus genome in hand. In the last few weeks in the Baltimore laboratory, I had cloned a DNA copy of another poliovirus strain – type 2 Lansing – which had the interesting ability to infect mice. I spent the first few years in my new laboratory studying this virus and how it caused paralysis in mice. We found that the type 2 Lansing viral capsid was important for the ability to infect mice. Later, we narrowed this down to 8 amino acids. The type 1 Mahoney strain of poliovirus – which I had studied in the Baltimore laboratory – cannot infect mice. However, if we substituted 8 amino acids of the Mahoney capsid with the corresponding sequence from the Lansing genome, the recombinant virus could infect mice. Our sequence analysis of poliovirus RNA had revealed an unusually long 5′-noncoding region. We began to carry out experiments to understand how such a viral RNA could be translated, and found that this long sequence enabled translation in the absence of a cap protein. This observation lead to the discovery by others that the poliovirus 5′-noncoding region contains an internal ribosome entry site (IRES). In the ensuing years our interest in translation continued. Examples include our finding that cell proteins bind to the poliovirus 5′-noncoding region, now known to participate in regulation of translation and genome replication, and understanding the inhibition of cell translation by poliovirus. Years later we developed a functional assay for the IRES in yeast, allowing identification of cell proteins needed for internal ribosome binding. There is one area of research that has received the most attention in my laboratory, and on which we have published most extensively: the interaction of viruses with cell receptors. Towards the end of my stay in the Baltimore laboratory I became interested in how poliovirus attaches to and enters cells. I came to Columbia with a strong interest in identifying the cell receptor for poliovirus, which we subsequently achieved. This finding lead to a series of studies on virus attachment to cells and virus entry. We produced transgenic mice susceptible to poliovirus, and used them to study aspects of poliovirus replication and pathogenesis, including how the virus attaches to its cellular receptor, regulation of viral tissue tropism, and the basis for attenuation of the Sabin vaccine strains. The finding that poliovirus tropism is regulated by the interferon response lead to a change in the direction of our research. Beginning in the early 2000s we began studying how poliovirus interacted with the innate immune response. We found that poliovirus is relatively resistant to the antiviral effects of interferon, a property conferred by the viral 2Apro proteinase. How poliovirus is sensed by the innate immune system has also become a focus of our work. With the looming prospect of poliovirus eradication, and subsequent prohibition of work on the virus, we have also turned our attention to rhinoviruses, agents of respiratory illness. One focus has been to establish a mouse model for rhinovirus infection. This story would not be complete without mentioning my foray into science communication. I have written a virology textbook and a blog about viruses, and began three science podcasts, including This Week in Virology, This Week in Parasitism, and This Week in Microbiology. My use of social media to teach microbiology to the world has been documented in a Social Media and Microbiology Education and in my Peter Wildy Prize Address. None of this work would have been possible without the participation of 24 Ph.D. students (Nicola La Monica, Cathy Mendelsohn, Eric Moss, Robert O’Neill, Mary Morrison, Ruibao Ren, Elizabeth Colston, Michael Bouchard, Suhua Zhang, Alan Dove, Sa Liao, Yanzhang Dong, Yi Lin, Brian McDermott, Melissa Stewart Kim, Steven Kauder, Julie Harris, Amy Rosenfeld, Juliet Morrison, Angela Rasmussen, Jennifer Drahos, and Esther Francisco), 7 postdoctoral fellows (Gerardo Kaplan, Marion Freistadt, Michael Shepley, Ornella Flore, Juan Salas-Benito, and Scott Hughes), and many technicians and undergraduate students. 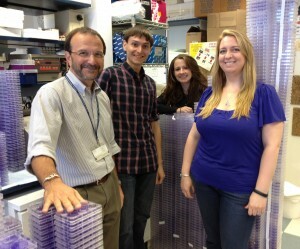 My laboratory currently consists of postdoctoral scientist Rea Dabelic, and graduate students Ashlee Bennett and Michael Schreiber (pictured above). Counting my time here, together with my Ph.D. and postdoctoral years, I’ve been working on viruses for 37 years. I do not know how much longer I will be doing the same, but it’s safe to say that it won’t be for another 37 years. But whenever I stop directing virology research, I will continue to write, podcast, and teach – you can expect nothing less from Earth’s virology professor. Congratulations to you, Vincent — married to it longer than I’ve been married! Now that’s tenacity. Very nice carreer and your blog is excellent! Many congratulations. Discovering your blog and podcasts has resparked my love of science. Many Congrats on your first 30 years as a PI and professor! What an impressive career, and it’s still on the up-slope of the bell curve! You are an idol, an inspiration to many! Wishing you all the goodness of the ‘Virosphere’!! great work and keep fighting!